This is not a Puppy For Sale ad. This is a story about being a Responsible Breeder and finding the Perfect Home with Loving People for a tiny, "Special Needs" puppy. It is a story of why, I BELIEVE IN MIRACLES. 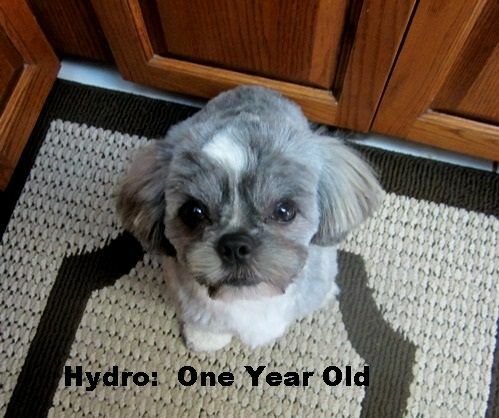 This is "Hydro's" story. Responsible Breeders do not simply discard or sell to unsuspecting people, puppies with Physical and/or Mental Health problems. 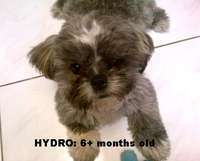 So here is the story of my baby HYDRO. I so believe in God’s help when these things happen. I truly believe a “Higher Power” was looking out for Hydro since he drew his first breath at birth. When I felt despair at his eyes pointing in 2 different directions, a miracle happened and his eyes straightened out so he could see. He stopped running into walls and could go in a straight line rather than just circling around and around until exhausted. 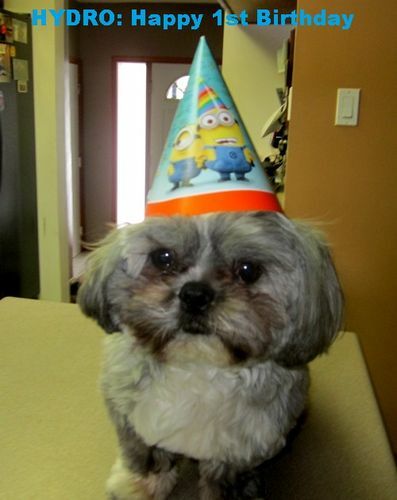 When he didn’t appear to get the hang of eating puppy food as a baby, I again felt despair. Then he suddenly figured out how to pick up food in his mouth like his brothers and sister had been already doing for many days. And best of all was when the huge “Open Fontanel” (where the bones of the skull had not knit together before birth) that took up most of the top of his skull at birth began to slowly close on his own, I knew for sure God was watching over him. This was not a small, Soft Spot on top of his head, instead the entire top of his skull at birth had no bone to protect him from head injuries. And it was closing on its own. Just another reason, “I believe In Miracles”!!! All that remained for him as he continued to have Learning Disabilities was, “Could he be House Trained”? “Would his learning disabilities become a thing of the past so he could be taught to respond like a normal puppy to teaching and training”? So then, as a “Responsible, Caring Breeder” there was finding a forever home for him with the right people . No selling this super cute, normal looking puppy to an unsuspecting buyer for a big sum of money by pretending there was nothing wrong with him. NO being in the business JUST FOR THE MONEY like uncaring breeders are. 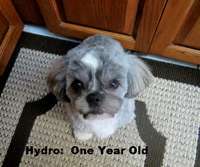 Could Hydro find that home? First was to have wonderful, loving people Foster him for a while in their home to get much needed feedback on his ability to be handle new situations, new sights, new sounds. Except for his continuing inability to catch onto house training and to keep him from bumping his head, he did awesome with Marva and Wayne. Now to begin looking for his Forever Home. I screened 217 emails and phone calls from people just wanting a CHEAP, super cute, small breed puppy in only 4 days’ time of Internet Advertising. An exhausting 4 days that went from early morning to late at night. They only wanted him because he was CHEAP. My ad was upfront and honest about his problems. My ad also clearly stated the strict requirements for someone to Adopt this puppy. None of the first 216 people met all my strict requirements. Number 217 not only met all the strict requirements to Adopt him, her voice on the phone was gentle and filled with love for this “Special Needs Puppy”. 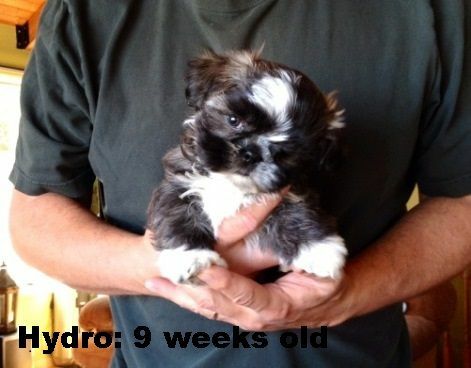 There is not enough words or ways to say, Thank You to Carla and Norm, who didn’t care about him being Cheap to get, they only cared about how they could help Hydro become a normal little guy with patience, love and kindness. Bless this couple. 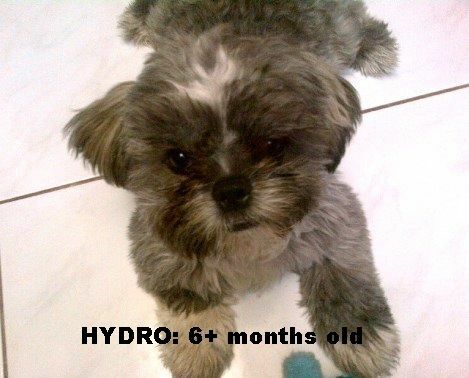 Just another Miracle for baby Hydro. 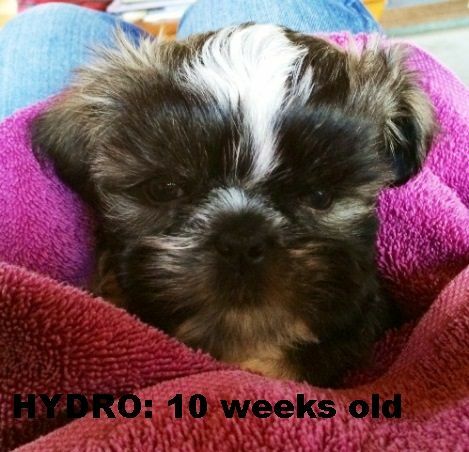 UPDATE FROM CARLA, ON HYDRO NEXT at 6+ months old. I am just over 6 months old now and am very smart I know the difference between my toys when mommy asks me to retrieve a certain one. I go non stop and am always helping mommy in the gardens especially when dirt is involved..lol. I am a very good boy and have no accidents in the house and use both my dog doors. I have flown on a plane to BC to visit Grandma and had no issues with the plane. I love playing with other dogs and love people. I love traveling with mom and dad to the races, they keep me safe and love all the people I interact with and am always worn out by the end of the day. I love my fur ever home as I am LOVED and well cared for. We have an inground pool and always get to go swimming when mom and dad go and I love it. I know my boundaries with the pool and have never fallen in. Mom has taught me to sit, fetch, come and am now learning to do high five. I also love going for car rides and lots of walks. Thank you Grandma Bunny for being very strict in finding my furever home. I have a big yard to run in and LOVE LOVE my humans to no end. 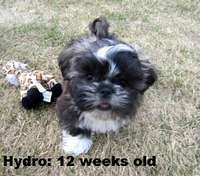 Photos begin of baby Hydro at 9 weeks old up to his current age now on his first birthday. 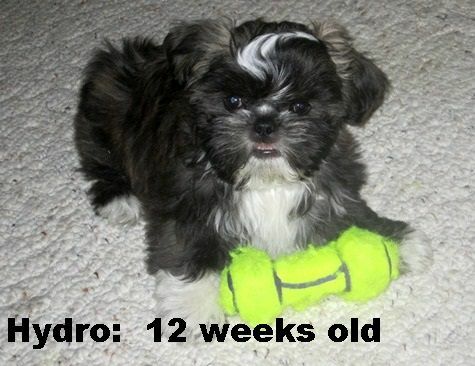 See him grow from a sweet, tiny puppy into a perfect, totally handsome dog. UPDATE: Hydro writes to us on his first birthday. Happy Birthday to me..... Happy Birthday to me……… Happy Birthday dear Hydro………….Happy Birthday to me……. Well I am a year old today and love my furever home. I love my Mom and Dad and they love me. I am spoiled rotten that is for sure. My little hole in my head has grown over and everything is all good according to my favorite Vet, Allison. I have learned to sit, lay down and dance on my back feet, I also fetch but don't like to give up my toys when I bring them back. I have flown on a plane 4 times to go to my Grandmas and she spoils me even more than Mom and Dad. I LOVE the snow and burrow in it and come in looking like a snowman. I also learned to swim this summer in our big pool and love the water as well. I went to obedience school and learned how to walk with Mom really good with my leash, I always stay on her right side and stop when she tells me to. I am very smart too, when Mom and Dad ask me to fetch a certain toy I get the right one and they reward me with a treat. ( I like treats ) I love my dog door and have free run in my big back yard and am fully house trained and go out on my own. As I said earlier I LOVE MY FOREVER HOME and am loved sooooo much and love my Mom and Dad back as much if not more with lots of kisses and cuddles. Thank you to my very first Grandma when I was born, Grandma Gayle, for taking the time to screen people and finding me the best home ever.